Enjoy a 3-river cruise from Nuremberg to Luxembourg while making art with support by West Co ast artist Patricia Banks. New landscapes offer excellent vistas to add inspiration to your art production or to round out your portfolio. 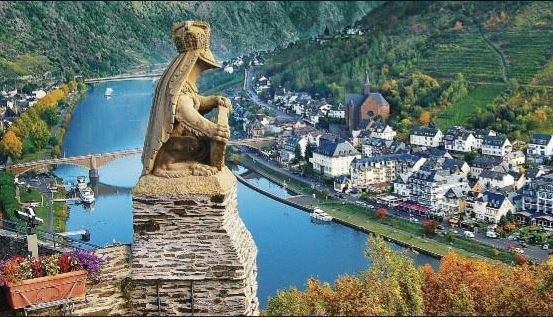 Imagine creating art of river views (the Main, Rhine, and Moselle), castles, medieval pathways, and so much more, all with a uniquely European and historical look not available to us in Canadian landscapes. Besides seeing wonderful Gothic, Medieval and Baroque architecture, this cruise also includes visits to the world’s largest ceiling fresco in the Würzburg Residence, a UNESCO World Heritage Site; and the beautiful Chagall stained-glass windows while in Mainz. Have a look at today’s contemporary art during a tour to Villa Concordia where German and international artists present their works. Whether painting, drawing, or sketching is your hobby or professional passion, it’s nice to have a professional artist alongside you to bounce ideas off of or to help give you tips to improve your technique. Patricia Banks RN, BScN, AFC is a Canadian Landscape painter best known for her detailed oil and acrylic paintings. She travels widely and is inspired by the magnificence and splendour of the natural environment. Patricia has exhibited across Canada and in the USA, and she has won several awards for her work. She has been an invited workshop presenter for the BC Art Teachers’ Association and enjoys teaching drawing and painting classes and workshops. Patricia has written numerous art related articles, and she currently writes a monthly column called Art Adventures for Nanaimo and Voyager Magazine. This cruise includes six land excursions (one tour at each port of call) and daily art instruction by Patricia Banks. To learn more about this 7-night river cruise on AmaWaterways’ luxurious AmaDante vessel, click here.